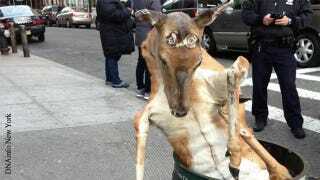 Some days I lose all faith in humanity: DNAinfo reports on the finding of a taxidermic deer in a trashcan in Washington Heights, a New York City neighborhood in northern Manhattan, on the corner 159th Street and Amsterdam Avenue. The deer was stuffed upright into the garbage, with its front legs curled into a resting position and its haunches pressed in a seated position in the garbage can. What macabre and insensitive person can do this?